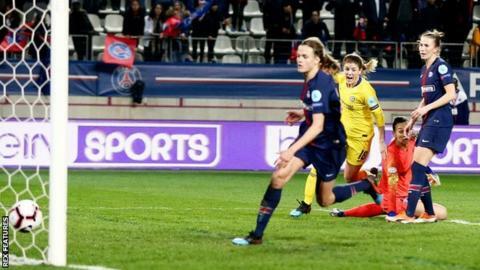 Maren Mjelde scored a dramatic injury-time goal at Paris Saint-Germain to send Chelsea into the Women's Champions League semi-finals. The tie looked set for extra time until Mjelde poked home from Karen Carney's cross to seal a 3-2 aggregate win. Kadidiatou Diani had put PSG ahead on the night with the game's first shot on target early in the second half. A calamitous own goal by Chelsea keeper Ann-Katrin Berger made it 2-2 on aggregate before Mjelde won the tie. The Women's Super League champions will face holders Lyon in the last four, after they saw off last season's beaten finalists Wolfsburg 6-3 on aggregate. Chelsea pressed early on but failed to threaten to add to their two-goal first-leg advantage for much of the match. The Parisians were nullified for much of a poor first half, but did show late glimpses of their capabilities - Diani sending a warning shot narrowly wide, before Marie-Antoinette Katoto was wastefully off target. Diani, however, sparked two-time finalists PSG to life when she turned home a low Ashley Lawrence cross from 10 yards out immediately after the break. Berger's terrible fumble as she attempted to collect a floated corner made it 2-0 on the night and level on aggregate with 34 minutes remaining. PSG were most menacing in search of a late winner, however Mjelde secured the aggregate victory for Chelsea when she raced in at the far post to prod home captain Carney's lofted cross. "I was a little disappointed with my team in terms of how we managed the game and I had to work hard as a coach to keep us in the game at times. PSG: Endler, Cook (Bunn 90+3), Geyoro, Katoto, Diani, Lawrence, Paredes, Berglund, Perisset (Glas 75), Formiga, Wang. Unused substitutes: Kiedrzynek, Diallo, Zamanian, Morroni, Baltimore. Chelsea: Berger, Blundell (Carter 74), Mjelde, Eriksson, Andersson, Spence, Ingle, Ji, Bachmann (Kirby 60), England (Bright 60), Carney. Unused substitutes: Lindahl, Cooper, Riley, Engman.